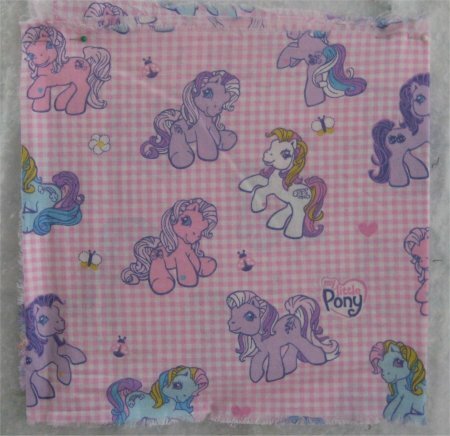 It just so happened that as I was rummaging through my stash, looking for something else, I rediscovered 12" selvage inches of My Little Pony fabric that I had bought for a long-abandoned project. 12" isn't much to work with but I figured I could think of something to make for Laurie. I decided that since I liked the Kyoto pattern so much as a quilt, I would use it again for a pillow. 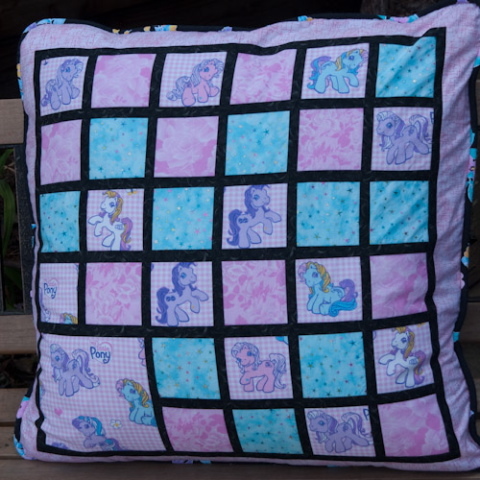 I fussy cut all the Ponies that I could and used them in many of the focus fabric squares. Light blue fabric with hot-pressed foil stars and a pink tone-on-tone floral were the companion fabrics to round out the selection for the squares. The border fabric was pink tone-on-tone linear design. The backing was black fleece. The piping was bias strips leftover from another project: black background with blue, pink and purple flowers ... *EXACTLY* the colors used in the My Little Pony fabric! I couldn't have found a better fabric if I had manufactured it myself! The very best part was that all the fabric used to make the pillow came from my stash! woo hoo! The big bucks expense was the pillow insert, but I even got that 1/2 off, as Joann's was having a sale. A zipper is at the bottom of the pillow cover to facilitate removal for laundering. 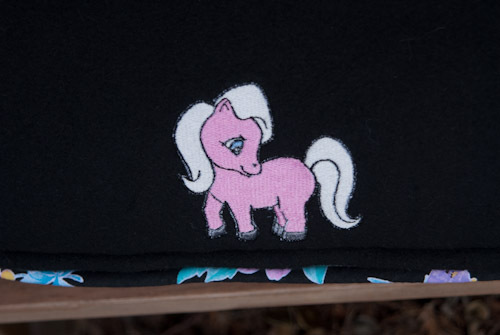 I was able to find a My Little Pony machine embroidered design at Designs by SCK. This site has some very cute and wonderful designs *and* allows you to buy them singly, as well as in sets. Since I only wanted one design, this worked out perfectly for me. The design is embroidered on the fleece, towards the bottom of the pillow.